Today's post will be something of a change. I met Stacey Cochran last summer at Launch Pad, the NASA-funded astronomy program for writers. Stacey has been charting his own course, through self-publishing and ebooks. It's an interesting story -- and the stories Stacey has to tell are interesting, too -- so I invited him to SF and Nonsense to explain. Without further ado, heeeeeere's Stacey. ED: So what exactly is CLAWS about? 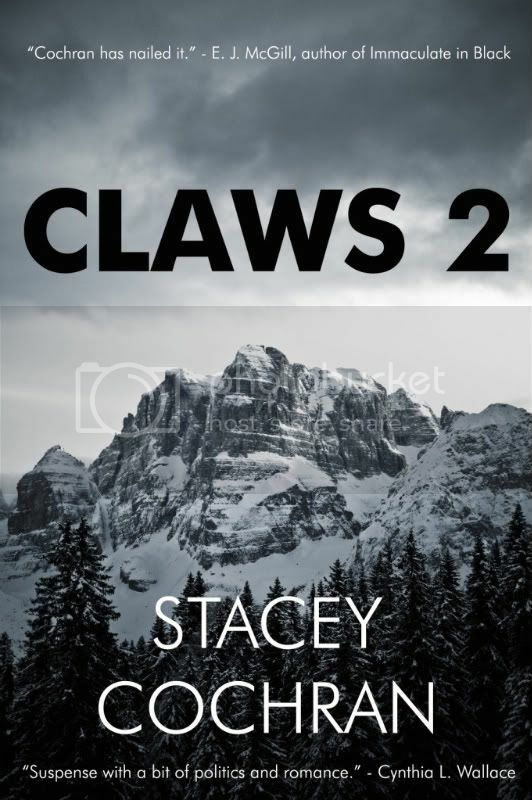 STACEY: CLAWS is a wildlife thriller series featuring biologist Dr. Angie Rippard who gets drawn into police investigations regarding animal attacks on humans. So far, there are two books. Titled (interestingly enough) CLAWS and CLAWS 2. The first book focuses on mountain lions and is set in Arizona. The second book centers around the "What if" question regarding grizzly bears in Colorado. The last Colorado grizzly was presumably killed in 1979 by bowhunter Ed Wiseman. However, after the research that went into the first novel on mountain lions, I realized that large predator populations were seeing a surge in numbers. I wondered if, like cougars, grizzly bears were seeing a dramatic up-tick in populations, and if so, would they migrate south from Wyoming to Colorado. Coincidentally as I was writing CLAWS 2, a number of credible grizzly sightings started popping up in Colorado newspapers. ED: Your scenario was correct? STACEY: I don't know about that, but it does seem likely. Conservation efforts have had a positive and dramatic impact with regards to mountain lions. Cougars have reached carrying capacity for most wilderness areas in the American West. It seemed logical that grizzly bears, which are a threatened species would see an increase in numbers, too. There are some major differences in reproductive biology between these two large predators (mountain lions are much more efficient, biologically speaking), but the numbers do tend to support an increase in grizzlies. If they over-extend their carrying capacity in Wyoming, it doesn't take a giant leap of faith to imagine a population could migrate south to Colorado. I wanted to set the table so to speak and open a discussion of how best to manage a Colorado population of grizzly bears. As writers, I think that's our charge. Not to answer questions. Just to raise them. And if you can do so in an entertaining way, then kudos to you. ED: You've chosen to publish these books yourself, as eBooks. Why? STACEY: That's a great question. Like a lot of young writers, I wanted to follow the traditional path. Everybody said get an agent. I did. I went through two in five years. Neither could sell the CLAWS series. Or any of my other novels. I came to realize after writing eleven novels, some people are simply not meant to go the traditional route. I have tried. Probably more than anyone else you'll ever meet. Since the mid 1990s, I've received somewhere around 3,000 rejection letters and have never had a piece of fiction professionally published. It's astonishing really. I've been doing this fulltime for over a decade. Along the way, I learned how to publish my work on my own. By the time eBooks exploded onto the scene, I was in a good position to know how to publish, market, price, and promote novels. Primarily online. This past year has been nothing short of a career breakthrough. What no one could have known early last year was that eBooks would just continue to build and build and build. I'm now drawing 70% royalty on novels that traditional publishers didn't think would sell, and I'm selling a lot of books. Now CEOs of major publishing houses are estimating that by 2015, 50% of all books sold will be eBooks. Sometimes if you just work hard enough and stay at it long enough, you'll find your own way to succeed. ED: Do you still want to be traditionally published? STACEY: Of course. I've taken a lot of heat on the blogs in the past 18 months. Even though an increasing number of traditionally published authors are weighing more heavily the decision to self or traditionally publish, I personally wouldn't turn down the opportunity. To me working with a publisher on my fiction would be the ultimate cool. That said, I've kind of carved out my own little corner in the sandbox, and I'm doing alright. I don't feel as desperate as I did four or five years ago. There’s a light at the end of the tunnel. And that light pays 70% royalty rates in the hottest market in the entertainment industry. If on your own you can sell a boatload of books, that's a kind of security no one can ever take from you. On some level, I wonder if I've always known this. ED: Do you consider yourself a science-fiction writer? STACEY: Another great question. My very first entry into the profession of writing was with my science fiction. In 1998, I was selected as a finalist for what was then called the Isaac Asimov Award. The good folks at Asimov's invited me down to Ft. Lauderdale for the IAFA conference, and of course I went. I met Joe Haldeman, Peter Straub, Sheila Williams, Ben Bova, and a bunch of other enormously gracious and talented folks. I mark this conference as a turning point in my career. I'd been writing pretty seriously for about five-seven years prior, but this recognition solidified in my mind that my time on this earth was meant to be spent as a writer. Over the years my fiction has changed, and I've found my home most recently lies in suspense. Still, I see the thumbprint of sci-fi over everything I write. I really want to challenge myself as I move into my late 30s and early 40s to push myself toward a genre that doesn't already exist exactly. ED: What would that look like? STACEY: I don't know. Some strange amalgam of suspense and literary redneck realism maybe with overtones of crime, mystery, and a good old fashioned ghost story thrown in for kicks. And I wonder why I've never found a traditional publisher. ED: Well, good luck with that. I'm sure you'll do great. And thanks for visiting SF and Nonsense today. STACEY: Thank you for having me. It was my pleasure. Stacey Cochran was born in the Carolinas, where his family traces its roots to the mid 1800s. In 1998 he was selected as a finalist in the Dell Magazines undergraduate fiction competition, and he made his first professional short story sale to CutBank in 2001. In 2004, he was selected as a finalist in the St. Martin's Press/PWA Best First Private Eye Novel Contest. He lives in Raleigh, North Carolina with his wife, Dr. Susan K. Miller-Cochran, and their son, Sam, and he teaches writing at North Carolina State University. His website is here. Stacey's books include CLAWS , CLAWS 2 , Amber Page , The Colorado Sequence , and The Kiribati Test . I like what you've done with the place. Cozy.